JJ-CCR develop a new canister, the XRC X-tended Range Canister. 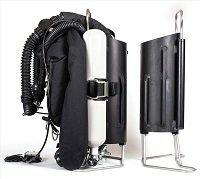 The X-tended Range Canister will provide the experienced diver with a total runtime off nearly 6 hours. the overall length of the unit stays the same! The radial scrubber included in the XRC packagewill carry 4kg of Sofnolime 797 providing a total runtime of up to 6 hours. Observe that this canister will only be sold as an option and not as a complete rebreather. The canister comes complete with stand, handle and radial scrubber. All other parts from the original rebreather will fit directly on the XRC!